Last night I spent a long time flipping through an old journal and remembering where I've been. Reading the old memories and the old prayers helps me see how far I've come and how far I have yet to go. The journal I read last night contains some of the most important moments of the past five years of my life. It holds memories from the year I lived in Texas and the months preceding my wedding, my first year of marriage and the beginning of my work at Beeson. I scribbled countless prayers, scripture verses and endless musings in those pages. Sometimes I laughed. Other times I cried. But I always wrote to remember. I'm ashamed to admit that I have a bad habit of losing my train of thought when I pray. I start my silent prayers with good intentions but before I know it, I’m chasing rabbits down overgrown paths, and I forget not only what I was praying for but also that I was even praying to begin with. Even worse, sometimes I forget the things that I pray about, and I have no way of knowing when God has answered my prayers. I began writing my prayers down the summer after I graduated from high school. I had kept a diary since the fifth grade, but that summer, something shifted in my relationship with God, and I began to write to him. My diaries grew up with me, and they became journals, a written record of my spiritual life. Remembering is a key to perseverance. The book of Judges tells us that the people of Israel failed to remember the God who had delivered them, resulting in a gigantic mess. Every time God raised up a new leader for them, they rallied and had a brief little revival. But it didn’t take long for them to forget again, and the cycle repeated itself. I don’t want to be like the people of Israel. God forbid I forget the way he has worked in life. Things are good right now, but I must remember that the peace in my present was wrought by pain in my past. 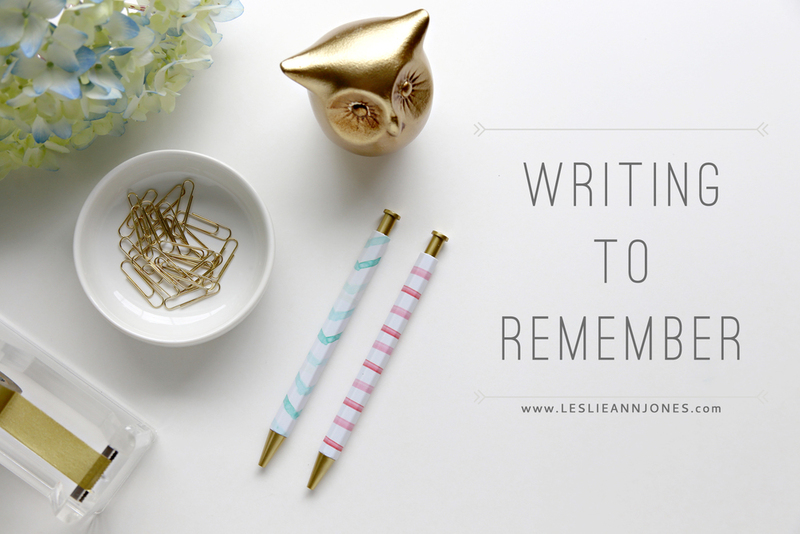 As I sift through the memories recorded in my journals, I cannot help but see God’s work. The most difficult year of my life came when I was a junior at Mississippi State. I became a prolific journal writer that year. Every night I sat down and poured my aching heart out on paper. It was a “sifting season” for me, a time when God stripped away one by one all the things I held dear. God used those events, the things that I thought I could not handle, to mold me in ways I could not see if I had not written them down. Time softens memories and takes the edge off emotions. I’m on the other side of that heartache now. When I pick up that particular journal to remember, I know that it will be a walk through sharp pain. Change is never easy, and it was a year of change, but I rejoice when I read those wrenching prayers, because God is faithful, and he took his broken and bruised little girl and mended the damage. I stand before you as a whole-hearted woman because God picked up the pieces of my life and put them back together in a way that is far better than the life I had built for myself. That is something I don’t want to forget. Sometimes it's disheartening to look at the journals and see that I still struggle with the same things. I still wonder where I'm headed, and I still have to be reminded that the words of truth that God has spoken over me are really the only ones that matter. Despite that, looking through the journals encourages me because they show me God's faithfulness in the midst of my insecurities. I don't write for posterity's sake. In fact, I've instructed my husband to burn the journals if I die. I write to remember. Because only when I've seen where I've been can I remember where I'm going.